Despite the diligent and tenacious efforts of dedicated folks around the world, rumors persist that effective meetings continue to be scheduled and attended. Effective meetings provide a space for genuine collaboration, efficient use of time, increased alignment, improved morale and engagement and most worryingly…tangible and positive impact. Ruining a meeting is hard work. So, before we get to some of the more advanced techniques, we’ll start with a basic tactic to really get your meeting, and those pesky attendees, off on the wrong foot. Whenever you schedule a meeting, the first step is to try to schedule it to be back-to-back with another meeting. Don’t worry, this is easier than it sounds. If you are lucky, you will use a meeting scheduling tool that defaults to start and end on the hour. Hey presto! If your meeting starts on the hour, it’s highly likely that it will be back-to-back with someone else’s meeting that ends on the hour. Bonus points, if the previous or next back-to-back meeting was also scheduled by you! Ideally, you will schedule your meeting to last for an hour, and that will lay the foundation for someone else’s meeting to be back-to-back. If you are new to ruining effective meetings, let me take a moment to explain the value of back-to-back. If your meeting starts as another meeting ends, that gives zero opportunity for someone to mentally rest or emotionally reset. And don’t underestimate the power of not having the chance to move around, grab a snack or hydrate, or run to the bathroom. All of these things will help to undermine someone’s ability to helpfully contribute to the next meeting. SIDENOTE: It can be easy to ruin a meeting as the host. But, attendees can help too. If you receive a meeting that is back-to-back with another meeting, please do just blindly accept it, and under no circumstance should you ask the host to have it start later, or end earlier, to provide helpful gaps for people. After you have warmed up with back-to-back scheduling, you’ll need to start to do some of the really heavy lifting. Perhaps the most critical role of the meeting host, is to keep the purpose of the meeting hidden. If people, especially attendees, learn the purpose of the meeting, if they can somehow glean why the meeting is being held, that can lead to preparation…and preparation is only a hop, skip and a jump on the way to collaboration…and collaboration is worryingly close to impact and outcome…and we certainly don’t want any of that nonsense. Whilst novice meeting ruiners might be at a loss as to how to hide the purpose of the meeting, you can find safety and comfort in the experience of others. When specifying the meeting subject, be as vague and generic as you can. “Catch-up” or “Team meeting” are pretty solid choices. WARNING: Don’t ever, ever, use the body of the meeting invite to describe the meeting purpose in any kind of helpful detail. That just plays into the hands of preparationists. That’s what they want you to do!! Advanced meeting ruiners, can provide a clear purpose for the meeting, but then allow, even encourage, the meeting to wander off topic. But, that’s really beyond the scope of this blog post. See the screenshot below, for an example of what you don’t want to see: A “Meeting Purpose” and a “Context”. Keen eyed readers of the screenshot above, will see that a dynamic agenda tool is being used. If you want to keep ruining meetings…you certainly don’t want to start using something like Instant Agenda. 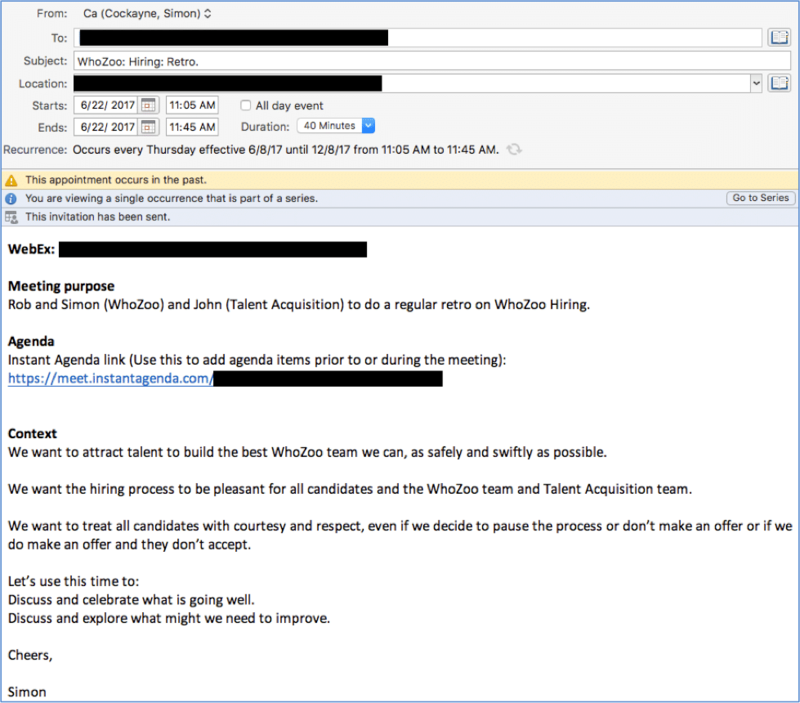 “Never prepare!”, is really a backup, in case the meeting purpose does get leaked, and it becomes clear why someone wants to get some folks together. Obviously, you don’t want to work in an environment where the meeting purpose is being revealed ahead of the meeting…but it will happen from time to time. A helpful guideline here, is to accept a meeting before reading any of the body, which could contain a meeting purpose or context. Don’t add any preparation to your to-do list. Don’t add a reminder, hours or days before the meeting, to refresh your memory. Don’t make any notes of things to discuss or questions to ask. 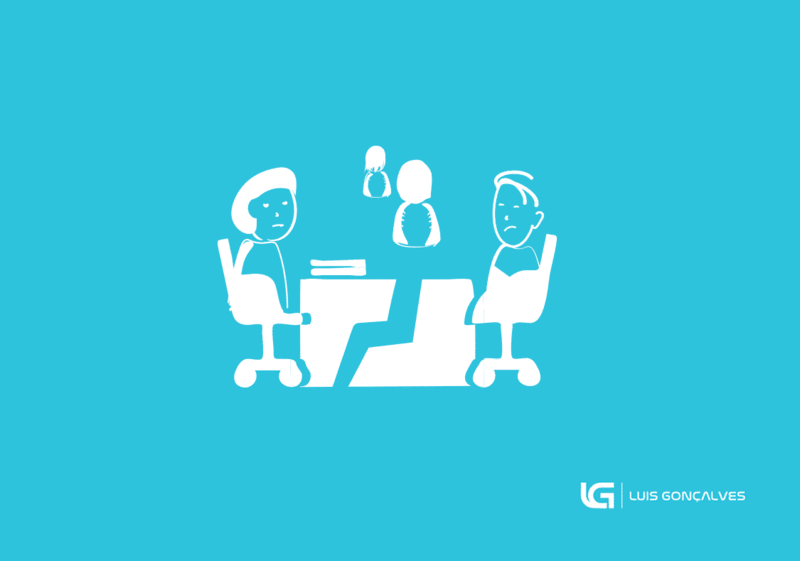 And definitely do NOT make contact with the meeting host to explore or modify the purpose or the agenda in any way. Your brain has no problem to listen to what is going on in a meeting. Listening to what is going on can cause involuntary reactions. Your passion and natural diligence can, all too easily, lead to learning and cause all kinds of helpful contributions. You can nip this success in the bud with a simple trick. All you have to do is Multi-task. If you are only focused on the meeting, you are not focused on ruining the meeting. Cell phone – While you are listening to the meeting audio, do use your cell at the same time for activities not related to the meeting. Tweeting, Facebook, texting are good starting points. Laptop browsing – If you haven’t got your cell phone handy, you can browse around the desktop versions of social media apps or just process your email. If you are remote, remember to keep your line unmuted, that will allow the sound of you typing distract others, too. The mute button always has a place in remote meeting disruption. It’s a quick way to waste your time and someone else’s by trying to contribute to the meeting, when no one can hear you. But, don’t stop there! Use the mute button, to allow you to multi-task. Try having a separate conversation with a nearby colleague or even on another line…ideally the conversation really needs to be utterly unrelated to the meeting topic. A major concern for anyone planning to ruin a meeting is the danger that someone might suggest an idea. New ideas that challenge the status quo are perhaps the most dangerous of all. Brilliant ideas can be hard to destroy. Judge an idea by who suggested it! You’ve got to make it personal. For example, if Toby suggests an idea…keep talking about “Toby’s idea”. Then shift the whole conversation to be about Toby and whether an idea suggested by Toby warrants pursuing. Especially draw attention to Toby’s title, years of service, and if Toby has ever had another idea that failed…then even better, turn the conversation to that past failure. The last thing you want to do is judge the new idea on its own merits. Remember, Toby’s idea is not going anywhere, if people don’t like Toby. In an emergency, if a novel and courageous idea is gaining traction, do talk about any time something similar has been tried in the past and failed. PROTIP: It doesn’t matter how long ago that was. The echo of failure from years or even decades ago can help hobble a new idea today. Running over time is the mark of meeting-ruining excellence. Only a master of meeting-ruining, though, will see the two-edged blade that is running over time. First, it’s a no brainer that this meeting running over, will spoil the start of any subsequent activities. So that pain is in the bag. Nice! Secondly though, is a more nuanced benefit. As you get to the end of the meeting and it starts to run over, the meeting context changes. People are distracted by the start of their subsequent activities. Last minute items are squeezed and rushed through. Resentment of the long-running meeting will bubble and spread. But, you can’t run over time as a one-off. You need to run over in as many effective meetings as possible. If you are tenacious, you can help make running over time a part of your standard meeting culture. Ok, so we’ve saved the best for last. This really is the most important of the 7 tips we have covered. It takes time and effort to master how to ruin meeting. 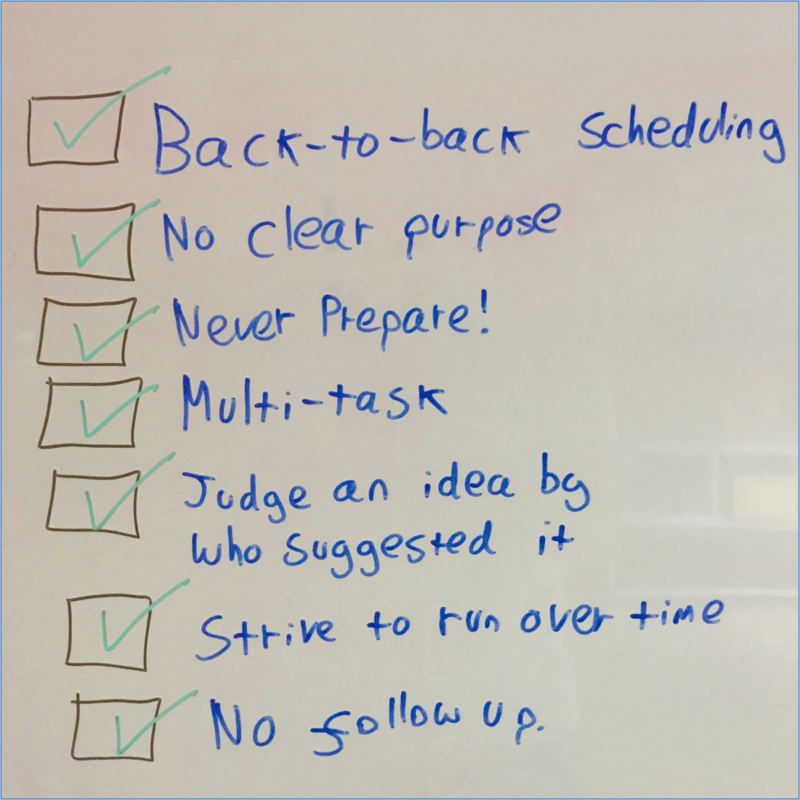 Back-to-back scheduling, No clear purpose, Never prepare!, Multi-task, Judge ideas by who suggested it and Strive to run over time…are all beautiful ways to ruin a meeting…but they won’t always work. 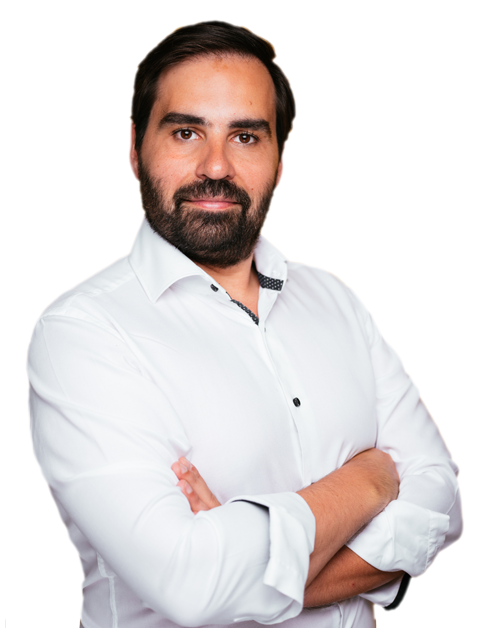 In, thankfully, rare situations…you might find that none of those things have worked, and you are on the brink of having held an effective meeting. Your only real hope then is to ensure there is No follow-up. If attendees have been swayed to action…you need to sow the seeds of failure now. Don’t state any kind of summary of decisions that have been made. Don’t get folks to commit to any kind of specific actions. If someone does unwittingly verbalize decisions or commitments to actions…be careful that nobody makes a written note of them. In future meetings, never refer back to past unmet commitments of previous meetings. In future meetings, focus on not meeting new commitments. 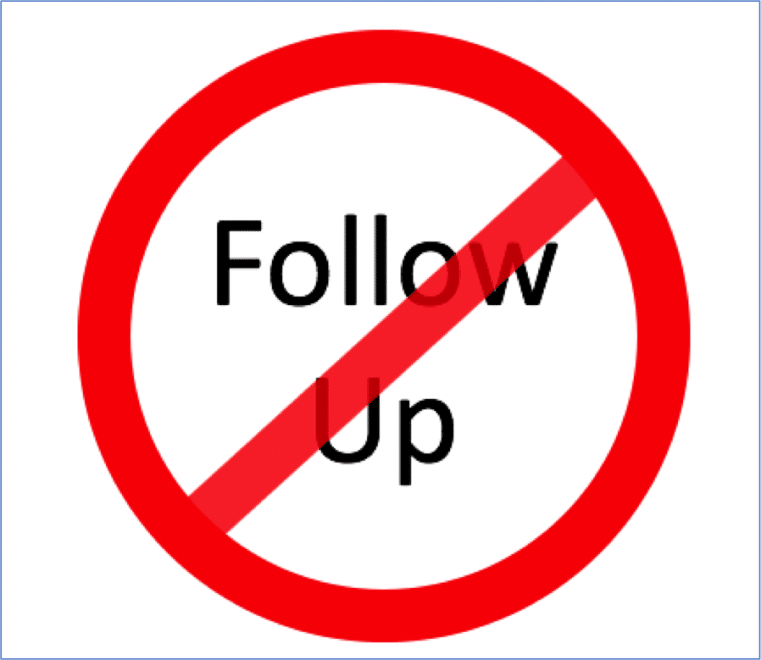 If you really want to ruin a meeting, you have to learn to cherish the awesome power of No follow-up. We’ve explored a lot here, and it can seem overwhelming at first. But if you practice hard, and diligently explore each of the tactics discussed, there’s really no limit to what you can fail to achieve. I hope you enjoyed my tongue-in-cheek ramblings here. The truth is, I care deeply about human collaboration. SIDENOTE: Over the years, I have made countless mistakes as a meeting host and a meeting attendee…including every one of the 7 anti-patterns I have written about here. Thankfully, I’ve learned so much from helpful folks along the way, about what can hurt and what can help, when it comes to meetings. I sincerely hope that this light-hearted post helps do the serious work of encouraging folks to reflect on how they host and attend meetings and consider ways to change and improve. Thanks for the shout-out Simon!! 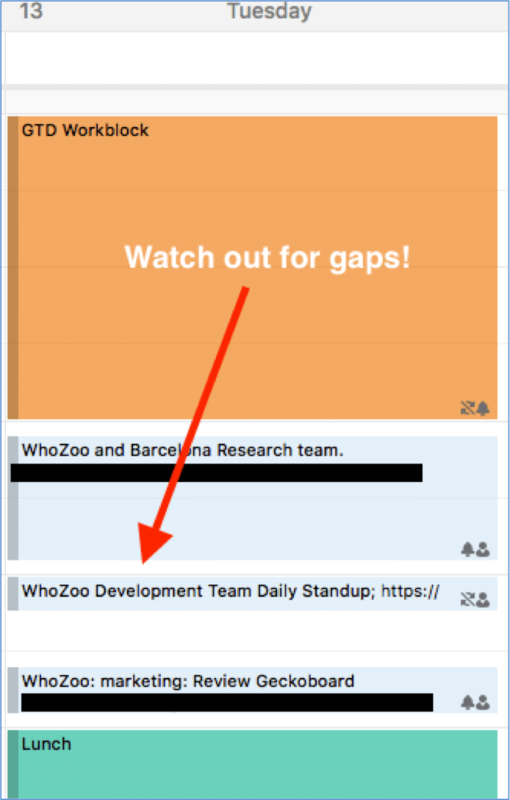 Instant Agenda is a premier tool for applying Agile principles to meetings. Why shouldn’t we treat our meetings the same way we treat our engineering and product development, right?